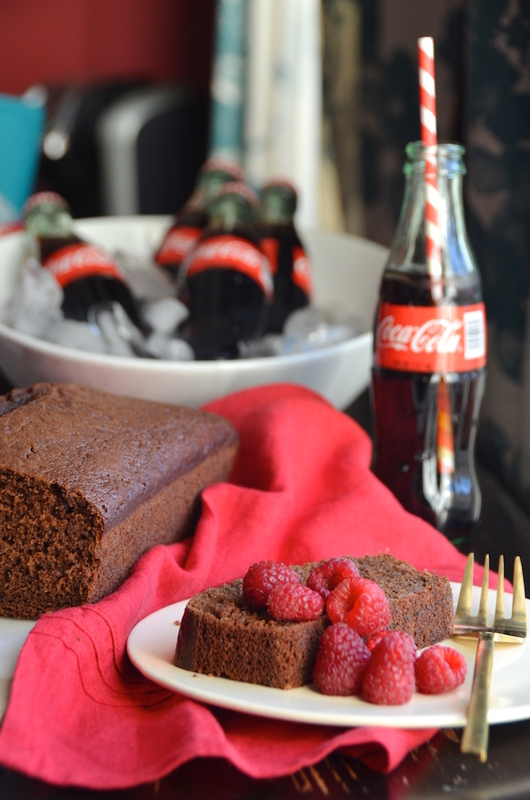 The holiday season usually brings along a bevy of overnight guests and party invitations, for which a recipe like this Chocolate Coca-Cola Quick Bread will most definitely come in handy. 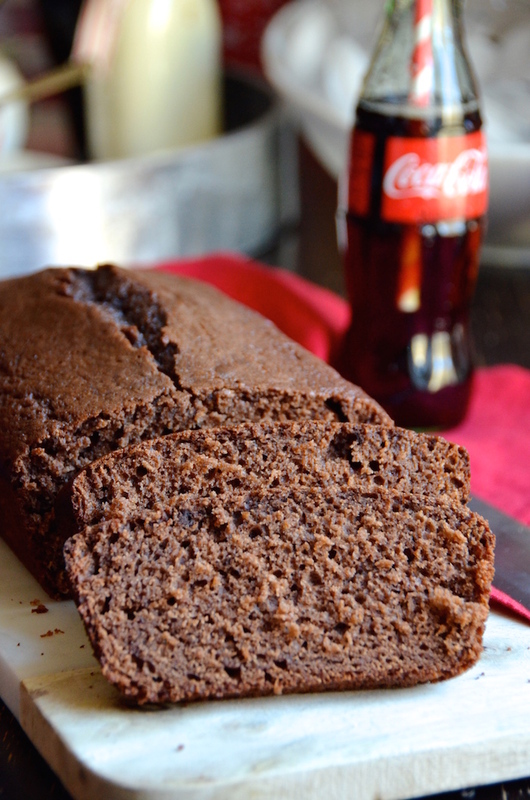 This moist and not-too-sweet bread is rich with hints of chocolate and a touch of classic Coca-Cola flavor. It's lovely on its own with a mug of your morning coffee, or toasted with a spread of jam or cream cheese as a quick snack later in the afternoon. It's one of those snacky cakes that can be left on the counter all day for enjoying as you wish. Some other fun ideas? You can wrap up a loaf to give as a thoughtful hostess gift, bring one in to the office holiday potluck, or bake a few to set out as an easy serve-yourself breakfast on Christmas morning. This last way is actually my favorite way to serve it! Here's my tip: Prep a tea and coffee tray the night before with mugs, sugar or honey, a selection of tea bags, and anything else your family or guests might need. 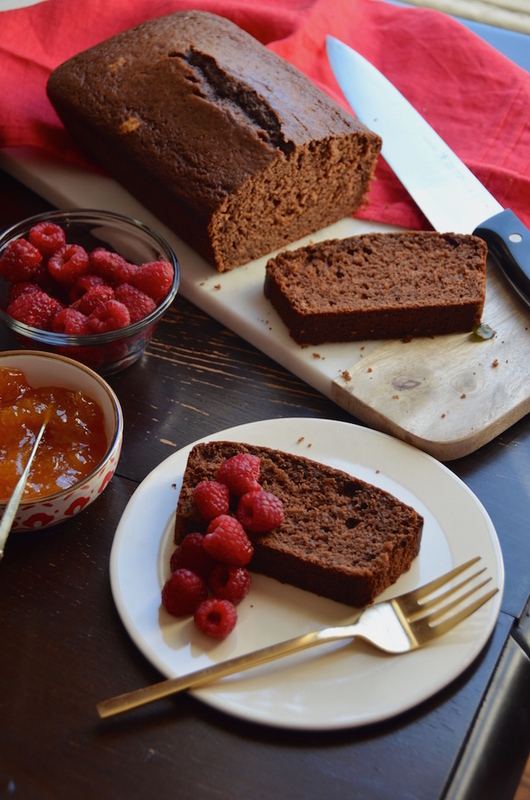 Add a loaf or two of Chocolate Coca-Cola Bread, a knife, and a few classic spreads (think peanut butter, jam, or soft salted butter). This way guests can help themselves as they come into the kitchen in the morning, leaving you with a few extra minutes to catch your breath before the craziness of the day commences. Christmas morning is all about tradition, cozy pajamas, and spending time with family. No need to get overly elaborate just because it's the holidays! A comforting baked egg casserole like a strata or easy fritatta is a great way to serve a crowd without having to stand over the stove all morning. Just prep the night before and then pop in the oven before you start opening gifts. Pick up a box of your favorite donuts from a local bakery or those cereals your kids always want but which you never let them have. (If not the holidays, when, right?) And don't forget to fill up the fruit bowl! Crisp apples, juicy grapes, and bananas are easy and crowd-pleasing ways to keep folks happy during the busy morning. If your family or guests tend to wake up at different times--or you have a big day ahead--opt for stocking the fridge with grab-and-go options like individual frittata muffins or hard-boiled eggs, a batch of homemade granola to sprinkle over yogurt or enjoy with milk, or baked oatmeal that can be cut into squares and reheated in the microwave. Potatoes can take forever to make--especially if you're cooking for a crowd. I like to par-cook mine by roasting the night before then just popping back in the oven to reheat and crisp before serving. Sausages can also be fully cooked, then reheated just before serving. 5. 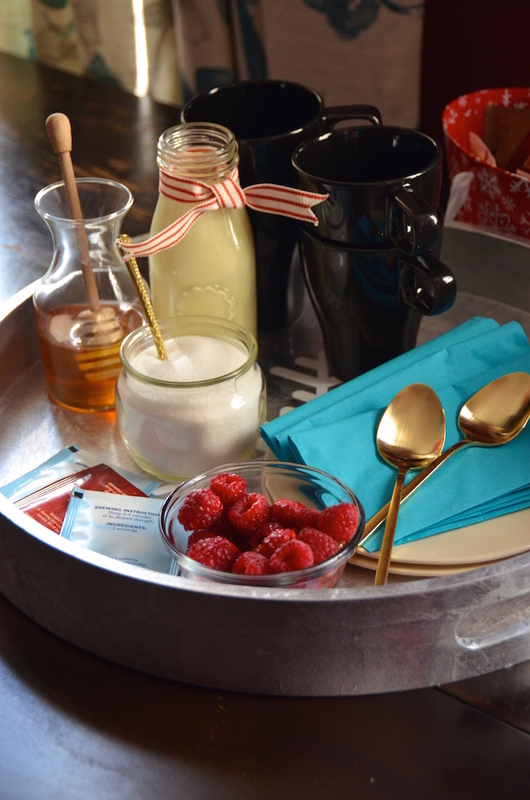 Set the Table Ahead of Time--or Skip it Altogether! Set the dining table the night before, and pull out any special dishes or napkins you plan to use. That way all you have to do is finish the food, and serve! Or want to keep things casual? Serve the food family style and let everyone fill their plates to enjoy around the fire or coffee table while opening or playing with gifts. Disclosure: This post was sponsored by Coca-Cola. All recipes and opinions are strictly my own. You can also visit the Coca-Cola Pinterest Page for more entertaining tips, inspiration, and ideas. Thank you for supporting great brands that make it possible for me to create fresh new content for you! Preheat oven to 350 degrees and grease a 9x5” loaf pan with baking spray. Line the bottom with parchment paper, and set aside. 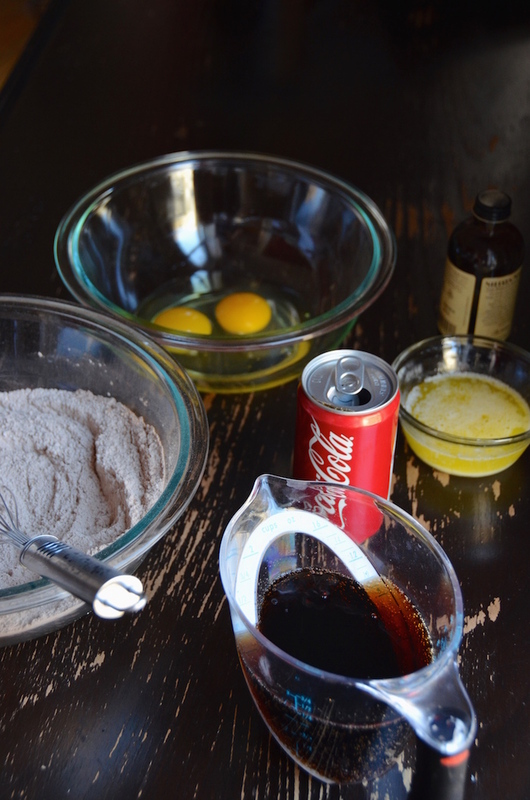 In a medium bowl, whisk together the Coca-Cola, melted butter, eggs, and vanilla until evenly combined. In a separate bowl, whisk together the flour, sugar, cocoa powder, salt, and baking soda. Add the wet ingredients into the dry, and stir well until evenly combined. Pour into the prepared loaf pan and bake 45 to 55 minutes, or until set with a slight crack down the top center. Let cool in pan for 5 minutes before loosening the edges and sliding onto a baking rack to cool completely.